Preheat oven to 425 degrees F. Line a baking sheet with parchment paper, set aside. Pour riced cauliflower into a microwave-safe bowl. Cover loosely and microwave on high for 4 to 5 minutes, or until softened; let cool. Using a clean dish towel or cheese cloth, drain cauliflower, removing as much water as possible. Transfer cauliflower to a large bowl. Stir in eggs, mozzarella, parmesan cheese, Italian seasoning, and garlic powder. Spread cauliflower mixture onto prepared baking sheet and form into a rectangle. Spray lightly with olive oil spray and bake for 12 to 15 minutes, or until golden. Take cauliflower crust out of the oven and spread a layer of marinara sauce on top. Sprinkle half of the mozzarella cheese on top and layer the prosciutto on top of the cheese so that the prosciutto is covering the crust. Sprinkle the remaining mozzarella on top and bake until the cheese is bubbly, about 6 minutes. 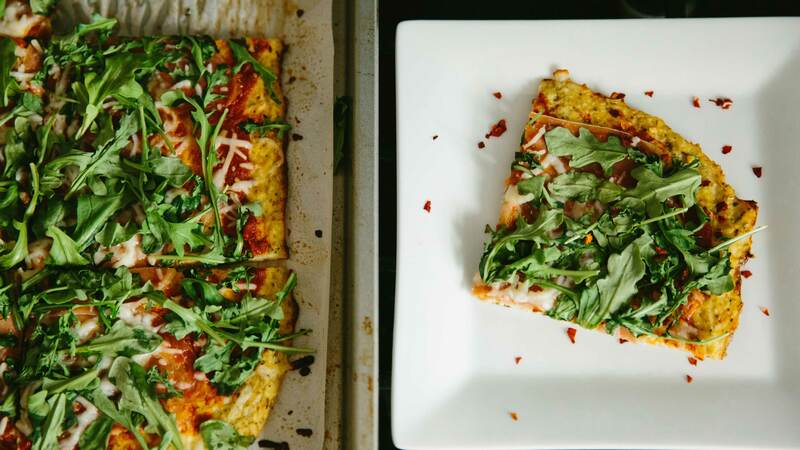 Remove from oven and immediately scatter the arugula on top, so that it can slightly wilt from the residual heat. Serve immediately. **Cauliflower can be bought pre-riced in the produce section. If not available, place 1 head of cauliflower into food processor and pulse until cauliflower is riced.